BalanceFrom BF-C1 is a hot new release vertical climber with a solid and sturdy build and a small LCD display panel. It is designed for a very effective total body workout- both cardio and resistance training without leaving the comfort of your house. So it will not only help you burn calories but also strengthen and tone muscles and build endurance. You will get toned arms, flat and hard abs and maybe six-pack, leaner and toned and stronger legs and better overall body shape. The shipping weight is 35 pounds, and it has the robust cast iron frame so it feels safe and stable at all times during your workout. The LCD display shows the distance, time, calories, speed and scan indicators. It has a simplistic design and is relatively easy to put together and you can start using it straight away. 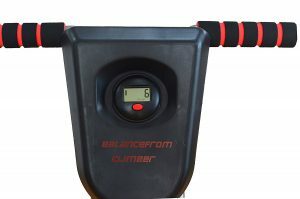 BalanceFrom BF-C1 is claimed to be better than most types of exercise or home gym equipment, both in terms of effectiveness and value for money, being a low-cost product. It appears to be a decent alternative to running, walking or jogging and promises great results as it mimics mountain climbing. The height is adjustable for different people at different heights. It is claimed that you will burn twice as many calories as any other regular forms of exercise and you will be getting more muscles involved. All the nicely padded grips are comfortable to hold and non-stick as they play an important part in this workout. The rubber pads that you step on are also non-slip and textured and will feel stable. If your goal is to burn calories and fat, this will do a nice job. Unlike running on a treadmill or outdoors, a vertical climber such as the Balance From BF-C1 offers a low-impact type of workout- cardio and strength and there will be no burden on your joints or knees. It is an ergonomically designed and stable unit that will give you an awesome and challenging workout of your triceps, biceps, shoulders, legs, abdominals and more. Old or your young, short or tall people (anyone up to 6’3″ and anyone OK with the challenge) can use it comfortably, due to the adjustable height of the handles. It has a conveniently foldable design and you can move it to a convenient corner, put it under your bed or in your closet. This is a US stock and you will probably get it shipped pretty fast. As a backup of its decent quality, it is offered with a two-year warranty by Balance From and a hundred percent satisfaction guarantee. You can be free of any worries as the customer service will be helpful in case you encounter any issues. You may contact them via phone or email during business hours. You will get very quick results from the BalanceFrom BF-C1 if you use it every day or a few times a week, combined with a healthy eating plan.